Last week, WPTV showed you deplorable living conditions inside a Riviera Beach complex. For years, tenants at Stonybrook Apartments have reported mold, leaks, broken appliances, infestations, illnesses among children, and holes in the wall. Those problems were brought to light during Hurricane Irma and despite promises made by local and state officials, residents say nothing has been done. However, on Wednesday a sign of relief for those living in the 216 units, which are a Section 8 multi-family housing project on MLK Boulevard. 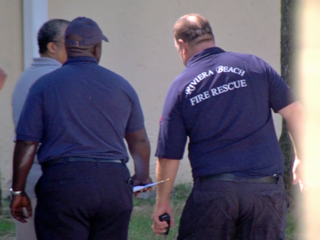 That morning, our cameras caught the City of Riviera Beach code enforcement -- along with Riviera Beach Fire Rescue -- performing safety inspections in each unit. Officials are staying quiet on what brought them out there in the first place-- other than routine inspections -- but the people who live there are hopeful for something to finally change. “I’m glad they’re here. i’m glad they’re here because it’s to a point where somebody has got to speak out for us," said Dina Walker, who has lived at Stonybrook for several years. On Wednesday, she watched code enforcement and fire rescue walk door to door with masks and clipboards. “We’re not here to displace any of the residents…we’re not here to cause any undue harm to them," said DaWayne Watson, public information officer for Riviera Beach Fire Rescue. Residents said code enforcement is checking for damages and other reported conditions in the apartments. Fire rescue confirmed crews are working to ensure each unit has working fire alarms and extinguishers. “We don’t have fire extinguishers. At least I don't in my unit, but my alarm system works well," said Walker. However, the issues don’t stop there. WPTV requested code violation records on Stonybrook Apartments over the past two years. In 2016, we found citations for mold, holes in walls and air conditioning units not working. One of those units involved a pregnant woman with five kids. A code inspection after Hurricane Irma revealed issues that residents claimed were there long before the storm — like severe mold, leaks, and missing fire alarms. One document from September 2017 states tenants in certain units were living in "conditions that are unsafe." The property is owned by Tennessee-based Global Ministries but recently managed in the last two years by Ohio-based Millenia Housing Management . Millenia told WPTV in a statement last week that it is working to improve conditions for residents. We understand the frustration the residents of Stonybrook Apartments are experiencing. We are under contract to purchase the complex from its current owner and we are very eager to begin making the changes that will result in a complete transformation of this property – including rehabilitating all 216 units with new kitchens and new bathrooms, completely transforming all building exteriors, expanding green space and building a new 3,100 square foot community center. On April 26th, we presented a comprehensive proposal to the City of Riviera Beach Planning and Zoning Board describing the $11.5 million post acquisition investment we are prepared to make in this property. The P&Z board recommended approval and will soon be going before the entire City Council for final approval. We look forward to providing the residents of Stonybrook with the quality homes they deserve. Residents told WPTV they are hopeful but skeptical of those plans, at least until they see more movement on the project. WPTV also asked fire rescue if the property is now considered safe following their inspections since Hurricane Irma. But last week, residents invited WPTV into their homes to show the leaks, thick mold in the AC, holes in the wall, and exposed electrical sockets — all issues tenants say were reported and not fixed. “It’s not fair, it’s not right. it’s like we’re not humans. and nobody should have to live like that," said Walker. Residents said the problems have become so deplorable they formed their own residents council to stage protests. The group even connected with Palm Beach County Tenant's Union for assistance and support. “Our kids are involved in this and I love my children dearly to just sit here and let them suffer," said Lewis, who is the Stonybrook Resident's Council co-chair. Lewis has been vocal about the conditions since forming the council. She said she is feeling hopeful about seeing officials out on the property. Fire rescue said the department conducts routine inspections every year and added that so far, they have not seen any major issues. It is unknown how long the inspections will last. “Those are always concerns -- not just for adults -- but for children," Watson said when asked about the reported problems. "If we run across those types of incidents or those types of violations, we’ll address them and go from there."